Benesch, Philip. “What’s Left of Popper?” Social Epistemology Review and Reply Collective 6, no. 9 (2017): 50-61. 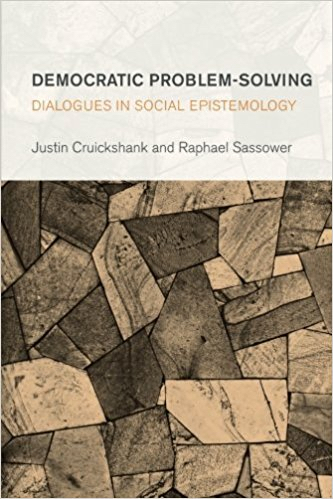 Justin Cruickshank and Raphael Sassower’s Democratic Problem-Solving, Dialogues in Social Epistemology (Rowman & Littlefield, London, 2017) touches upon the continuing relevance of Popperian approaches to progressive social reform and political action. Yet, though it touches upon Popperian approaches, the sweep of these dialogues is both refreshingly broader and irritatingly cloudier. I have some criticisms of the distinct contributions made by Cruickshank and by Sassower. The exchanges that compose this book begin with Cruickshank’s bold exploration of uncharted commonalities in the work of Karl Popper and Richard Rorty. He finds common ground in their anti-essentialism, commitment to piecemeal social change, and anti-authoritarianism. Yet this last is somewhat subverted by Rorty’s admiration of Heidegger, despite his unrepudiated pro-Nazi and anti-Semitic stance, as Sassower reminds Cruickshank, first gently (30), then less subtly (47-49). Rorty complimented Popper for doing “a good job” in noting the philosophical precursors of modern totalitarianism, but Rorty chose not to criticize great philosophers, such as Heidegger, when only part of their work supported such morally and politically despicable outcomes (Rorty 1988, 33; Fuller 2004, chapter 16). I do not see where Cruickshank acknowledges or comments upon this element in Rorty’s philosophical work or the challenge it must offer to Cruickshank’s quest for Popper-Rorty synergies of help to a revitalized anti-statist Left. Steve Fuller has argued that “a sign of our non-Popperian times is that the most natural way to interpret the idea of ‘social epistemology’ is in terms of a consensus-seeking approach to inquiry, not, as Popper himself did, a set of mutually critical agents” (Fuller 2001, 343). I believe that Cruickshank would dismiss this as a binary by which he will not be bound, and would accuse Popperians of legislating the scope of inquiry and policing the boundaries of dialogue (42). Cruickshank then sets forth his own division between “speedy” and “slow” dialogues and hands out speeding tickets to those who infringe his legislative schema. In this way, we are cautioned not to criticize certain positions as dogmatic or irrational, and those positions are returned to the dialogue (from which they were not excluded), and granted delaying privileges (which they have always retained). Cruickshank would not call this a consensus-seeking approach, he has avoided that term; he prefers we call it critical slow dialogue. In his second contribution (chapter 3) to the present dialogue in social epistemology, Cruickshank proposes that while Popper correctly rejected “justificationist speedy dialogue” he incorrectly embraced the “critical speedy dialogue” of permanent revolution in science. Popper was incorrect because “[p]eople may be emotionally, ethically and politically committed to their ideas” (36). Yet, contrary to Cruickshank’s portrait, Popper, outside the confines of his seminar, appears to have more typically pursued slow dialogue, favoring slow reading and slow writing, he took pains to revise his papers, hoping for clarity and concision, so that they might be understood in plain English (not his first tongue). He recognized that neither reason nor science were self-sufficient but were entangled with the commitments Cruickshank identifies. Admitting that criticism may take a long time to effect ideational change opens up the possibility of slippage ‘backwards’ and for Popper that would put science and democracy at risk. In place of slow piecemeal ideational change there had to be a utopia of hyper-rational and instrumental machine-like agents changing their ideas very quickly (42). Yet, the core of both Popper’s epistemology and his political philosophy is a fallibilist attitude of reasonableness—that “I may be wrong and you may be right, and by an effort we may get nearer to the truth” (Popper 1945/1966, v.2., 225, sentence italicized in the original; he emphasized that this should be regarded as his moral credo, Popper 1994, xii). The collaborative effort of which Popper speaks will most often involve the “slow piecemeal ideational change” that Cruickshank incorrectly claims Popper rejected. Typically, each of us hold ideas that are partly wrong and partly right. Of course, there may on other occasions be fairly rapid ideational change, as when one’s entire “horizon of expectations” is shattered by an event and requires replacement (see Popper’s 1948 paper on bucket and searchlight epistemologies, now appended to Popper 1972/1979; see my comments, Benesch 2012, 101, 109 and notes). And yes, of course, there is always the possibility “of slippage ‘backwards’”—nothing is inevitable and, short of death, nothing is established with finality; political and intellectual gains won in one era may be lost in another. All one can do is craft institutions, traditions, and methods that may provide minimal safeguards, but the future very much depends on the loosely-associated individuals and their decisions. It seems to me that Popper’s attitude of reasonableness strictly prescribes neither a speedy nor a slow dialogue, but it does require a good-faith argument between individuals seeking to identify their errors and “get nearer to the truth” (never, of course, likely to attain certainty or absolute truth). In his first contribution, Cruickshank credits Lakatos, not Popper, with both the distinction of auxiliary hypotheses from core hypotheses and with the conception of research programs (15). In his third contribution Cruickshank tells us that “[T]he history of science does not conform to… Popper’s methodological prescription…” (85). We should think (slowly) about that statement: history does not conform to one’s prescriptions. One’s prescriptions are presumably for future action not past action; surely one should learn from the mistakes or inefficiencies of the past in order to avoid repeating them; one’s prescriptions may draw certain favorable examples from the past, but one would not expect a philosopher to prescribe conformity with the past per se. The reading of Popper by Cruickshank is remarkably distorted but it has become standard fare for those who credit Lakatos rather than Popper with the concept of research programs in science. From the 1950s Popper referred to these as metaphysical research programs—they were the motivators of particular scientific inquiries but these programs were not themselves scientifically-tested nor were any empirically-testable as a whole. Metaphysical programs may well persist, and change to these may be typically, although not invariably, slow. “They are… much harder to criticize than [scientific] theories—and much easier to retain uncritically” (Popper 1982b, 32). Contrary to Cruickshank’s claims (43-44), Popper’s approach to dialogue between metaphysical positions is hardly “speedy” although it is critical. In the Open Society, declaring that in the “conflict between idealism and materialism my sympathies are with Marx” (Popper 1945/1966, v2, 110), Popper explicitly endorsed Marx’s practical-critical humanism as a dualistic revision of materialism. Twenty-five years later, while advancing pluralism as a viable alternative to either idealism or materialism, Popper noted that “if forced to choose between any subjectivist or personalist view of human knowledge and the materialist or physicalist view I have just tried to sketch, I should choose the latter; but this is emphatically not the alternative.” (Popper 1972/1979, 296). Popper’s 1948 essay, “Towards a Rational Theory of Tradition” (now in Conjectures and Refutations), his response to Michael Oakeshott, may offer further understanding of his approach to ideational change, as may his discussion of culture clash in The Open Society and Its Enemies, and in The Myth of the Framework. Popper strove to avoid giving unnecessary offense to religious or other identities. He did not infantilize or coddle his interlocutors. He prescribed that we distinguish each theorist from his/her theories, so that one’s ideas might be criticized and discarded if found to be more erroneous or less enlightening than a rival idea with which it is being compared. As a result of the externalization of our ideas, our ideas might be treated as “objective” or exosomatic knowledge, with identified errors critically reviewed and set aside from current discussion. Popper, in his Darwinian phase, referred to this as “error elimination.” He proposed that, in a critical discussion, rather than we being martyrs to our ideas, our hypotheses should die in our stead. Popper’s poetic formulation makes an important point but we should not take poetry literally: hypotheses have no death. No ideas are ever eliminated from the Popperian “world 3” archive of exosomatic knowledge—so long as at least some of the artifacts in which they are encoded remain. I prefer Sassower’s alternative descriptor, “displaced”— certain ideas are displaced from our current inter-subjective critical discussion but remain retrievable from the exosomatic archive. As Sassower eloquently argues, “This means that the entire history of ideas remains alive, however dormant or forgotten here and there, until vestiges of it are rediscovered or found useful for explaining a new constellation of ideas or principles” (243)— my only quibble with Sassower’s point is that ideas are no more alive than they are dead; we should avoid biologicizing our ideas). All of these points are consistent with Popper’s earlier formulation (which was limited to science) that there can be no conclusive falsifications. In The Logic of Scientific Discovery, he had clearly stated his view that “no conclusive disproof of a theory can ever be produced” (Popper 1959/1980, section 9, 50—this statement was in the 1934 original; in 1959 he added text and a footnote emphasizing the point; see also appendix X.17, 440) [“experiments are never conclusive; and they must in turn be testable by further experiments”] and section 30, 109-111). “Critical speedy dialogue, contra Popper, is not possible, and the alternative to critical slow dialogue is justificationist speedy dialogue” (108) repeats Cruickshank in chapter 9, his fourth contribution to this dialogue. The assertion is rapidly followed by Cruickshank’s claim that Popper moved from an optimistic approach to politics (his attitude up to at least the late-1960s)—in which political experts might be held accountable by ordinary, un-deferential and active critical citizens—to a more pessimistic and technocratic approach, in which citizen participation is limited to post-hoc evaluation of policy and political performance at regularly scheduled elections. Cruickshank is wrong to claim that Popper’s opposition to either majoritarian or Rousseauian conceptions of democratic politics were features only of his later “pessimistic” phase (110). Popper consistently viewed democracy as a system for checking power, and for removing rulers disfavored by the majority (quite different from majority rule). Cruickshank appears to share Popper’s aversion to push-button plebiscitary democracy but bemoans what he sees in the later Popper: a tendency to entrust, between elections, decision-making to a technocratic, ideologically-neutral political elite (more on this last point at the end of the next section). Cruickshank may be able to offer an interesting and innovative interpretation of the chronology of Popper’s politics if he could show that the later political pessimism resulted from disillusionment with critical dialogue and a consequent resort to justificationist speedy dialogue. Indeed, Cruickshank approaches this view, noting a paternalism in the late Popperian conception where “the political elite would become the authoritative source of ethical justification, with their technocratic status allowing them to enact moral regulation of lay agents and the construction of a pseudo-consumer sovereignty” (112). If Cruickshank were to flesh out this aspect of his theory, it may offer a fertile contribution to Popper scholarship. Frankly, I prefer the Popper of the politically-optimistic critical (variable-speed) dialogue, the intellectual revolutionary who retained faith in the Enlightenment project of universal human emancipation. Abandoning Marx’s historicism while preserving his practical-critical activism, Popper understood that men make their own history, albeit constrained by material conditions and error-impregnated traditions. There may be no laws of historical development other than those humanity sets itself, and a foreseen outcome to history might become inexorable or inevitable only if unconstrained by material circumstance or sufficient counter-vailing will. The future is open, it depends very largely upon ourselves, upon decisions we make within the bounds of our technology. It depends on our publicly declared aims and purposes, and on the rules, standards, and agreements we establish to regulate and coordinate our various activities. Popper’s work is avowedly a contribution to normative philosophy, more broadly it is a contribution to efforts to improve humanity’s “plastic controls”—that is to say, our mutual self-regulation according to our standards and aims. He was a critic of bad or harmful metaphysics but Popper was not an enemy of metaphysics, least of all a disparager of that which may be irreducible to or inexplicable by physics (as Sassower notes, 243). While recognizing that praxis was both a spur and a bridle to our speculation (Popper 1957/1960, 56; Popper 1972/79, 311, 263), Popper praised the many metaphysical programs that have informed, guided and ennobled human activity. His methodological prescriptions for science may be analogous to those he offers for politics but they are never identical. Ethics regulates both activities, but there is no scientific basis for ethics and we had better eschew an ethics governed by political considerations. Popper consistently demonstrates this attitude towards our reception and proliferation of scientific knowledge claims in his 1988 apologia of a democratic two-party system; his ‘Day of Judgement’ essentially amounts to a falsifiable test. Democracy ought to be testable, in theory as well as in practice. Solving this problem (of the conditions under which democracy works most effectively) for Popper means changing the ‘old problem’ of ‘who should rule?’—which is unscientific because it cannot be falsified—to one that approximates the criterion of falsifiability as closely as possible within the political-scientific sphere. We concede that Popper does set an absolute standard by declaring ‘that … a rule of law that enables us to get rid of a government. No majority, however large, ought to be qualified to abandon this rule of law’ (Popper 1988). Setting aside this absolutist thinking which we attribute to the trauma of war, Popper merely points out that a two-party model has yet to be falsified under certain conditions, while the others, according to Popper, have (96-97). Popper did no such thing. Note that in the above passage the references to falsification are not part of the Popper statements directly quoted by Sassower and Jensen; rather these references are interpolated as if summarizing unquoted elements in Popper’s 1988 essay. But Popper does not make ANY reference to the concept of falsification (nor to science) in the 1988 essay (compare with Popper 1988/2012). The General Election “day of judgement” is not, could not be, and is not by Popper intended as an opportunity for empirical disconfirmation of a scientifically tested hypothesis. Sassower and Jensen want Popper to say this, have the preconception that Popper would say this if asked, and therefore creatively interpolate with wish-fulfilling abandon. For Popper’s cohorts, science could offer what the nation-state failed to offer: freedom and equality, knowledge and certainty… The new utopia would be a utopia surrogate; it would be Popperian … this revised scientific project offered demarcation criteria only as a first step toward a more nuanced method of conjectures and refutations that culminates at most with putative truths (92). Are Sassower and Jensen saying that Popper’s “science” aspired to offer the “certainty” the nation-state failed to offer or that his “nuanced method” sought to attain “putative truths”—rather than pursue the identification of error in our theories so that we may better describe and explain reality (perhaps here “putative truths” is used as a synonym for such tentative theories)? Outrageously ignoring (temporarily) Popper’s commitments to critical rationalism, humanitarianism, and the open society, Sassower and Jensen mutate Popper into Bacon “free to engage problem solving and criticism from a neutral perspective…” (94). In the midst of curtseying to Foucault and Lyotard, Sassower and Jensen take from Agassi’s mouth what they ought to have heard as sung from Popper’s tonsils—that to hold the view that science is ‘in flux’ “is also to argue that society is in flux, so much so that it deserves to be reassessed continuously” (101). Indeed, that is what the “openness” of the open society refers to. This line is presented more or less as statement of fact without it being open to critical discussion or dispute. Is there a way to argue rationally about aims? Don’t policy makers do this all the time when they offer alternative aims…We routinely use ‘scientific means’ to calculate the options we wish to set as aims for our community… It’s true that ‘its aims, at least, must be given before the social scientist can begin …’ But aren’t we here following Popper’s own methodological nominalist approach … (233-234). Yes: Popper did not deny a role to reason or science in aiding the critical evaluation of policy, programs or institutions. Reason clearly may have a major role in critical assessment of our aims and standards. But what Popper also clearly argued was that we could not establish our aims by purely rational or scientific means—he italicized the word “purely” in the hope that it would catch the eye of even a speedy reader. Popper noted that our reason and science are necessarily entangled with our emotional, ethical and political commitments—the very ones to which Cruickshank referred earlier (36). Popper held that utopianism and technocratic planning are typically inseparable from an aesthetic commitment to tidiness, to more efficiently organizing the crazy patchwork quilt of our social fabric (Popper 1945/1966, v1, chapter 9). And he described his rationalism as lacking self-sufficiency; it rested on the flimsiest of foundations, an irrational faith in the attitude of reasonableness (Popper 1945/1966, v2, chapter 24, sections 1-3, especially 231, cf. 258). Hence, for Popper, there could be no purely rational or scientific reform of society. Sassower hopes to reconcile utopianism and a redefined post-rationalist “reasonableness” as the core of his own non-relativistic brand of Popperian postmodernism. It is good to be creative, especially in an otherwise stagnant field, but one would hope to avoid too many distortions of the earlier theory one claims to be refuting or revising and augmenting. In particular, one might note that Popper was not opposed to small-scale, localized utopian experiments (a point perhaps implicitly and belatedly acknowledged by Sassower on 237). Popper’s objection was to holistic utopian engineering—the project to remake society as a whole, according to the intelligent design of some god-like human oligarchy (e.g. Plato’s philosophers, who were as god-like as it was possible for a human to be [here Popper reads the Republic rather too literally]; or the transformations to be wrought by Lenin’s party of “professional revolutionaries” and by subsequent central planners). Small scale social experimentation (preferably by consenting participants) might be subject to democratic and social scientific criticism, and may yield important insights to citizens keen to scale-up their projects. Of course, we may yet create a god-like artificial intelligence that will coordinate a world-wide communism with more efficiency and liberty than might be achieved through market mechanisms and the public policies of fissiparous polities. Otherwise we may well find holistic central planners to be resistant to criticism by ordinary citizens. If some citizens are inconvenienced by the implementation of utopian policy—and the larger the scale of the bureaucratically-engineered change, the larger the number of citizens likely inconvenienced—the more the central planners are likely to immunize themselves from criticism and to treat critics as improperly motivated or merely ill-informed. We may observe that Sassower appears to attack Popper from two rather different angles. In chapter 19 he accuses Popper of precluding science and reason from contributing to the setting of ultimate aims but elsewhere he (e.g. chapter 8, as quoted above) and other contributors to the dialogue suspect Popper of preferring technocracy. Of course, these are not mutually-exclusive positions, as a value-neutral technocracy may simply follow preset values or assume that what is systemic to society is natural or otherwise outside the scope of their decision. Popper spent quite a bit of The Open Society and Its Enemies critiquing political leadership by ideologically-neutral experts (e.g., Plato’s philosophers or Mannheim’s intellectuals) and he also disavowed ethical naturalism. Finally, we may note that Isaac Reed, (chapter 6) also raises important questions regarding Popper’s attitude to scientific work that is antithetical or harmful to an open society. It may be the case that Popper remained a child of the Enlightenment: he believed that the unflinching search for truth will aid universal emancipation. Yet, Popper also recognized limits to political (and presumably intellectual) toleration, for example: the need for an open society to suppress pro-slavery movements and to fight racism. Broadly, the integrity of a scientist is measured by pre-agreed, institutionalized values. A scientist qua scientist does not set those values, nonetheless that scientist as citizen will do so. The scientists cannot leave their consciences at the laboratory door. At the height of the Vietnam War Popper demanded a broader granting of conscientious objector status, spoke of the moral responsibilities of scientists (for example, those who might have demanded that the 1945 atomic bombs be used, if used at all, only on uninhabited locations or isolated military targets) and celebrated the post-Nuremberg principle that the “conscience of every human being is the ultimate court of appeal with respect to the question whether a command is…to be resisted.” (Popper 1994, 126). Popper concluded his 1968 essay: “Since the natural scientist has become inextricably involved in the application of science, he too, should consider it one of his special responsibilities to foresee as far as possible the unintended consequences of his work and to draw attention, from the very beginning, to those which we should strive to avoid” (Popper 1994, 129). The old lore about value-free Popperian science might surely now be set to rest. Reed and Cruickshank have noted the encumbrances imposed on Popperian problem-solving by The Poverty of Historicism. One might have wished that Popper had left that work as a neglected 1944-45 series of articles published in a not widely circulated economics journal. It was his first work written in English (its drafting precedes his 1940 article on dialectics) and it is stodgy and mechanistic in style, with little of the sparkle that shines through The Open Society and Its Enemies. Yet in 1957, hot on the heels of the repressed revolution in Hungary, the CPSU XXth Party Congress, and the ensuing wide-spread disillusionment among Western communists, Popper permitted the minimally-revised republication of the articles as a book printed in English. I conjecture that he wanted to talk with the Left at this critical moment and the Poverty seemed all ready for the purpose. The result was an intense six-year controversy that drew in critics as varied as Herbert Marcuse, Alasdair MacIntyre, and E.H. Carr, helped trigger Popper’s 1961 confrontation with Theodor Adorno, brought forth commentators who interpreted the Poverty as offering a “covering law” H-D model (e.g., in a 1961 conference paper and later publications, Alan Donagan popularized this model as the “Popper-Hempel theory”), and no doubt increased the misperception of Popper by those who were forming the New Left. [T]he Newtonian method of explaining and predicting singular events by universal laws and initial conditions is hardly ever applicable in the theoretical social sciences…[and] … in the social sciences, tests of a situational analysis can sometimes be provided by historical research” (Popper 1994, 165-166, 170). The distinction between the social-theoretical and historical sciences, so sharply drawn in the Poverty, seems to be blurred by Popper’s work in the 1960s. Indeed, Popper’s essays on evolutionary epistemology and “objective knowledge” reveal his renewed appreciation for dialectics and his interest in contributing to hermeneutics (see Popper 1972/1979, 162, 167, cf. 296). Yet this came too late for him to have influence on the emergent generations of the Left. He lacked Lakatos’ knack for savvy marketing. Kuhn’s Structure of Scientific Revolutions was easily assimilated by a Left that heard echoes of Marxian modes of production in a Kuhnian revolutionary succession of paradigms but that failed to see the resemblance between Marx’s praxeology and the Popperian conceptions of the growth of knowledge and autonomous sociology. Further alienated from the post-Tubingen Western Marxists and the wider academy they influenced, Popper later appears to have accepted the label they had repeatedly applied to him: when asked by Mark Notturno, circa 1992, why he had been spurned by so many academic philosophers, the ninety-year old Popper is reported to have replied “because I am on the right” (Notturno 2000, 166). Recognition of universal flux led Popper to reject both essentialistic approaches to social science and historicist conceptions of predetermined social development. In the volume under review, Reed, Cruickshank, Chis, and Sassower note the connection between methodological nominalism and political liberalism (pro-free-speech and pro-democracy) in Popper’s philosophy. Yet Popper consistently held a realist, non-instrumentalist and non-relativist philosophical position, normally construed as opposed to nominalism. From the late 1950s, Popper, no doubt in part tongue-in-cheek, described his position as that of a modified essentialist—with the emphasis on the modified. True to his earlier “methodological nominalism,” the label of “methodological nominalist” did not have great value to Popper, what counted was clarity in communication (if only he had been as flexible in his use of the “historicist” label). According to Popper, we use our terms to attempt to describe a reality that we never fully grasp—our terms, and especially our theories, are “nets cast to catch what we call the ‘world’: to rationalize, to explain, and to master it. We endeavour to make the mesh ever finer and finer” (Popper 1959/1980, 59). The best theories remain “rational nets of our own making, and should not be mistaken for a complete representation of the real world in all its aspects; not even if they are highly successful; not even if they appear to yield excellent approximations to reality” (Popper 1982a, 42-43). The point is to better approximate reality, to set aside theories that appear to be more clearly errant. As a realist and fallibilist, Popper was drawn to Plato’s Allegory of the Cave, not for its depiction of philosopher-emancipators nor for its presentation of an attainable and complete enlightenment, but for its portrait of the human condition, of humanity stumbling and groping its way to a piecemeal recognition of illusion and error (Popper 1963/1989, 28, cf. Popper 1994, 52-53, also compare Popper 1972/1979, 344f). I observe that Popper’s late ontology—a reformulated realism in which “the third world” of exosomatic human knowledge “is autonomous in what may be called its ontological status” (Popper 1972/1979, 161)—was preceded by Popper’s stumbles in the reception context of the republished Poverty of Historicism and by his reimagination both of methodological nominalism and of the prospects of an open society. (In the 1950s, Popper introduced the concept of the abstract society: a supposed deformation of the open society [Popper 1945/1966, v1, 174-175]. Popper’s initial political proposal of misery-minimization and socially-protective interventionism had relied upon concrete encounters between proximately-situated and compassionately-connected citizens. I believe that the prospect of an increasingly abstract society presented a significant problem for Popper’s political philosophy.) Popper’s late ontology did not come out of the blue, as some of his more perplexed commentators have suspected, but out of a discernable problem situation; it was a courageous effort to meet the multiple theoretical challenges with which he had been faced. Popper’s late ontology complements his earlier treatment of the theoretical limitations of Marxism. In The Viennese Socrates, I argued that Popper should be seen as the critical continuer of Eduard Bernstein’s revisionist Marxism. Like Bernstein, Popper exposed the gulf that opened between the scientific pretensions of post-Marx Marxism and the increasing dogmatism of the scientific socialists. He followed almost directly (but largely without acknowledgement) Bernstein’s critique of the prophetic chapter, chapter 25, in Marx’s Capital (Benesch 2012, 46-47), a critique Bernstein had originally advanced in his 1899 book, Evolutionary Socialism. Bernstein was also a precursor to Popper’s criticism of both Marxian historicism and the Marxian attitude to democracy. Yet, prior to the 1960s, Popper had not improved upon a Marx-derived dualism (of course, Marx did not see it as a dualism), a practical-critical humanism. The central claims of Popper’s late ontology free the Left from a cramped materialism. I suggest that, while unacknowledged by Popper, his late ontology is a workable and nondeterministic version of historical materialism—recognizing the full compendium of historically-accumulated knowledge as a dynamic and autonomous component in an interactive universe. His pluralist reformulation of materialism, while more elaborate than his earlier mind-body dualism, is still remarkably lean and minimally pretentious. “Objective knowledge,” the exosomatic product of flesh and blood embodied human minds, is said to survive only when embedded in matter (books, computer systems, art, architecture, etc.). The engagement of our minds with previously externalized ideas and theories is said to facilitate the partial autonomy of the mind from the physico-chemical processes of our bodies. Each of the three legs of Popperian “autonomous sociology”—antipsychologism, situational logic, and methodological individualism—are fortified. The claims of Popper’s antipsychologism are advanced directly by emphasizing the dependence of subjective knowledge on “objective knowledge” produced by other human beings, as well as on the externalized record of one’s own previous intellectual labor. Popperian situational logic and methodological individualism both benefit from Popper’s introduction of the concepts of “plastic control” and “downward causation.” The conceptualization of plastic control—our mutual coordination and self-regulation according to standards and aims reached “imperceptibly through lengthy deliberation” (Popper 1972/1979, 231-234)—offers a further refinement of a sociology that is individualistic but not atomistic. The concept of downward causation supplements Popper’s understanding of the ways in which group-membership transforms and augments the behavior and consciousness of associated individuals. Popper’s late ontology thickens his earlier historical sociology. In the preface to the 1959 first English edition of the Logic of Scientific Discovery he had already endorsed “the (at present unfashionable) historical method.” (Popper 1959/1980, 16). As noted earlier, Popper’s essays on evolutionary epistemology and “objective knowledge” reveal his renewed appreciation for dialectics and his interest in contributing to hermeneutics (Popper 1972/1979, 162, 167, cf. 296). In the 1960s, as he elaborated his late ontology, he proposed that “if we want to understand history, we must understand ideas and their objective logical (or dialectical) relationships” (Popper 1972/1979, 297). He refined a conception of the evolution of knowledge and allied this to a reiterated tetradic conceptualization of historical progress (problem 1-theory-criticism-problem 2, etc. etc.—see Popper’s “Pluralist Approach to the Philosophy of History” [lecture, 1967], Popper 1994, 140). An analysis of intellectual change would be an analysis of problem solving in the context of historically-specified traditions and institutions, “For what exist, for the historian, are people in physical, social, mental, and ideological problem situations; people producing ideas by which they try to solve these problems, ideas which they try to grasp, to criticize, to develop” (Popper 1972/1979, 300). Attempts to solve any given problem could be understood only by identifying the relationship of that problem to the matrix of traditions and institutions in which it had arisen. Popper, Karl. Objective Knowledge: An Evolutionary Approach, second edition, Oxford, Oxford University Press, 1972/1979. Popper, Karl. Quantum Theory and the Schism in Physics, London, Routledge, 1982b. Popper, Karl. Realism and the Aim of Science, London, Routledge, 1983. Popper, Karl. “On Democracy” [first published as “Popper on Democracy…” in The Economist, 23rd April 1988, 111-119] In Popper: After the Open Society, edited by Jeremy Shearmur and Piers Norton Turner, 360-369. London and New York, Routledge, 1988/2012. Popper, Karl. The Myth of the Framework: In Defense of Science and Rationality, London, Routledge, 1994. Rorty, Richard “Taking Philosophy Seriously.” The New Republic (April 11, 1988): 31-34.